E*Trade Mobile Pro for Android phones allows you to securely buy, sell, and place orders with just a few taps anywhere, Anytime during market hours. The app alos allows you to stay in touch with real-time quotes, news, charts, market commentary etc free of cost. 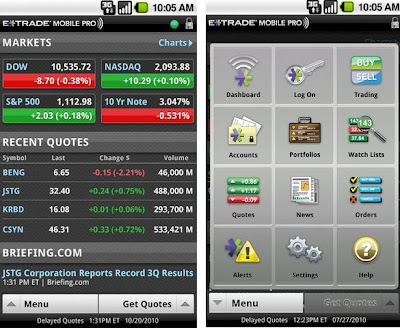 E*TRADE Mobile Pro is also fully integrated with your online account which means you can also check your holdings of stock in real time on your little android device. Download E*Trade Mobile Pro for FREE from HERE.